Just this morning I received an email about a new app for my mobile phone, developed by an American university, to screen for autism in babies and young children. Like most people, I’m a sucker for looking up medical information on the internet when I’m worried. While I try to stick to reliable sources, it’s incredibly easy get a diagnosis from Dr Google that’s either inaccurate or just plain wrong. Add to that the fact that I’m a new mother, and my late night internet searches are a recipe for large doses of (usually) pointless worry. Which is why the advent of apps that offer a reliable way of testing for certain disorders is such an encouraging development. In just a few weeks, we will be able to access an app developed by NeuRA’s Prof John Hodges and colleagues from the UK to screen for dementia. The app is based on the Addenbrooke’s Cognitive Examination or ACE, the gold standard test for screening patients with potential dementia. 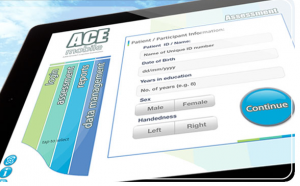 Originally a pen and paper test, the ACEmobile app has been designed for use on iPads and is self-scoring, meaning that very little training is required to use and administer the test. This also means that it’s reliable, something that’s often sorely lacking in the digital world. The app will primarily be used by psychologists, nurses and other health professionals so they can provide a report to clinicians – one that’s easy to interpret and allows comparison with what is considered a normal score in healthy older people. The greatest benefit of this app and other future forays of this kind into the digital world is that health care professionals can detect dementia early and accurately – and not just those professionals in specialist centres (where patients often face long waiting periods) but those working in the community as well. I’ve met families who struggled for many months wondering why the behaviour of their mother, father, uncle or grandmother had changed and if there was anything they could do about it. Being offered early diagnosis would have meant a world of difference to them, if only to have an explanation of what was going on. Going forward, early diagnosis is going to become increasingly important as treatments for dementia improve. Having witnessed firsthand the hard work of researchers at NeuRA – along with their colleagues around the world – I have every faith that new and better treatments are not far off. If you’d like to access the app, watch this space.